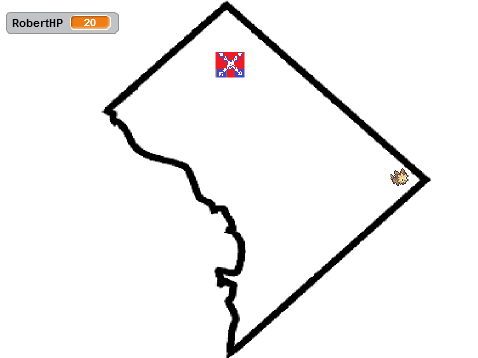 Washington D.C. to the east. North Carolina to the south. You must go through Virginia to reach Washington D.C. Northern Virginia has been polluted by the evil influence of the country's capital, hence the purple streaks of EVIL. At the very beginning of the game, Hillary's footprints will pass through Virginia. Dylann Roof with 10 HP. He drops an Oran Berry upon defeat. Lillipup's Royalty attack in Virginia. The left top-hat has damaged Dylann Roof. Effects: Three hats rise up above Robert, have a hitbox, and then scatter and disperse on their way down. Each scattered hat has a hitbox upon landing (which takes .9 seconds), but only one will hit before the enemy's invincibility frames kick in. Base Damage: 3 per hat hit. Evolution Differences: Herdier has tiaras, and Stoutland/Metagross send up crowns. Metagross's crowns rise higher and slightly faster. Explanation: Virginia was once known as the crown jewel of the South, and a major cultural and industrial centre. The Confederacy moved its capital to Richmond, Virginia after its initial capital in Alabama. Virginia was where the most powerful people in early American history were from or resided. Nowadays, Northern Virginia is commonly considered not to be an actual part of The South, due to the negative influence from Washington D.C. and many of its residents working for the federal government, instead of being real Southerners. South Carolina to the south. At the very beginning of the game, Hillary's footprints will pass through North Carolina. Lillipup using the Tar Heel technique in North Carolina, stomping over Dylann Roof. Effects: Begins a trail of footprints that lasts for 2.5 seconds. Wherever Robert moves, he will leave footprints behind. The hitbox is the entire trail, and it lasts as long as the trail does. Base Damage: 2 per non-invincible contact with the tar heel trail. Evolution Differences: Lillipup and Herdier share footprints. Stoutland has a unique footprint, and Metagross also has a unique footprint. Metagross's sound effect is a lot different than the dogs’. Explanation: North Carolina is known as the Tar Heel state. The exact reason why is unknown, but it's the most interesting thing with North Carolina that I could make a game mechanic out of. I concluded in my research North Carolina is the most generic former Confederate state. North Carolina to the north. South Carolina is where Robert begins at the start of the game. Dylann Roof with 10 HP. He drops a Liechi Berry upon defeat. Robert is watching the Palmetto drop on Dylann Roof's head. It'll defeat him instantly. Effects: Palmetto is a three-part attack. First, plant the tree with your space-bar. It will remain there, so Robert is free to move around. The tree will face the direction Robert was when he planted it. Press space-bar again to put an axe to the tree. Press it again for the tree to fall down. Base Damage: 15 damage upon the tree's impact. Evolution Differences: The axe is silver for Lillipup and Herdier, and gold for Stoutland and Metagross. Explanation: South Carolina is known as the Palmetto State, named after that tree. It's okay to put an axe to it, because logging is a big industry in South Carolina. The reason the game begins in South Carolina is because South Carolina is where the Civil War began, and it's also where the Confederate Flag controversy began, with states removing it from their properties. The move is based off of Villager's Timber in Super Smash Bros. 4, and the axe sprites used in Capture the Confederate Flag are from Animal Crossing. North Carolina to the east. 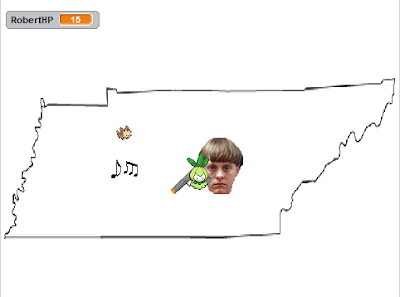 Tennessee borders the most amount of states in the game, with six. Note that, including Washington D.C., there are twelve states to go, so Tennessee plus its border states make up over half of the game. Robert tries to calm the captive Petilil with some country music. Effects: Robert emits a music note that extends a little depending on his direction. There are four possible very short music clips that may play while the music note is in effect, which is a little over 2 seconds. The hitbox is lingering throughout the note's duration. Base Damage: 1 damage per contact with a non-invincible frame. Explanation: Tennessee, and Nashville in particular, is considered to be the capital of country music, and music plays a huge part of its culture. South Carolina to the east. North Carolina to the northeast. 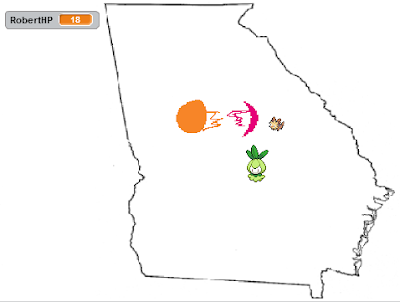 Georgia borders the second-most amount of states, at five. Robert watches his peach explode while Petilil watches. Effects: Robert lobs a peach grenade in the direction he's facing. The peach goes forward and then explodes into two pieces, covering a large, but linear amount of area in front of Robert. The hitbox is short. Base Damage: 5 damage, hitbox only on the explosion. 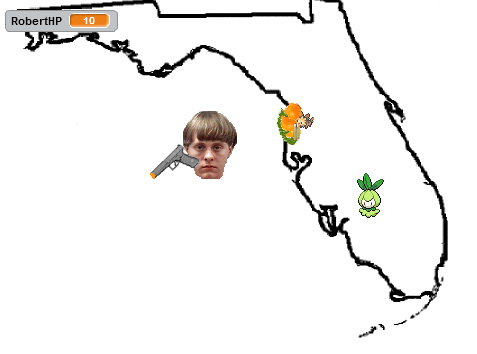 Characters may freely walk over the Gulf of Mexico (the blank space to Florida's west), and Robert will need to because the enemies will do so, and Florida's Secret Power is lacking in range. 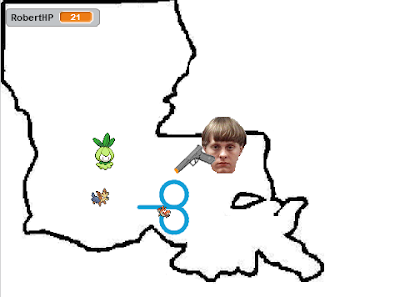 Robert tries to strike Dylann Roof with oranges, but Dylann is too far away. 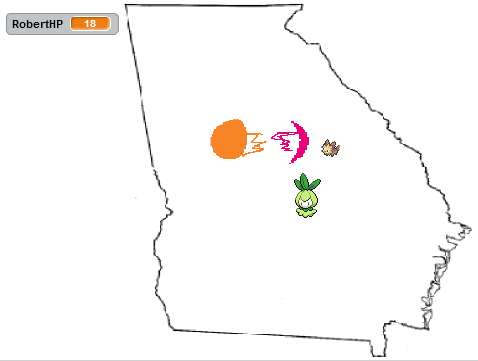 Effects: Upon pressing the spacebar, Robert will shoot out an orange. Pressing the spacebar multiple times will result in more oranges. The oranges have a large, random spread 90 degrees (-45 to 45) in front of Robert, and are very close-range. Each orange only has one, short hitbox. Evolution Differences: Stoutland-riding-Metagross's oranges go much farther from their sprite before the fruit's hitbox is applied. Explanation: Oranges are a major part of Florida's economy, and most of America's oranges are grown from Florida. The inspiration for the move's mechanic is from Splatoon's Splattershot Jr., although in this case, because of invincibility frames on enemies after being hit, more shots isn't necessarily more helpful. Since the oranges do NOT cancel, it's possible to freeze your computer with this move if you're irresponsible. Alabama seems to be the best candidate for being the very centre of the South.. Effects: Five Cottonee (one covering Robert, and one for each cardinal direction) surround Robert for .5 seconds. Any bullets that come into contact with the Cotton Guard are nullified and do no damage. Evolution Differences: Lillipup and Herdier both summon Cottonee, but Stoutland summons Whimsicott, and while riding Metagross, Robert summons Altaria. Explanation: You can't have a game about the Confederate States of America and not mention cotton somewhere, right? Of course, there's already a Pokémon move based off of cotton, being Cotton Guard. All of the Pokémon that can be summoned are of course those that can learn Cotton Guard, and it can guard against those bullets. Dylann Roof with 10 HP. He drops a Salac Berry upon defeat. The magnolia's petals exploding in Dylann Roof's face. Effects: Robert gets a magnolia flower out, splits the stem, and the magnolia petals extend diagonally from his position. 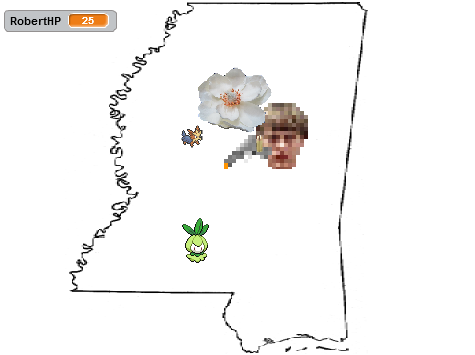 The hitbox is at the magnolia petal explosion thing. Explanation: The magnolia is Mississippi's state flower, and also the state's nickname. 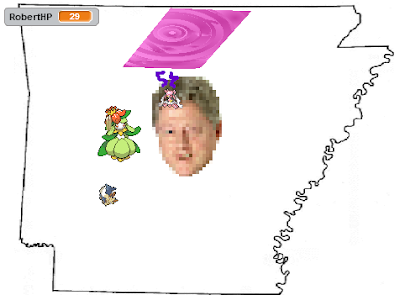 Bill Clinton has special reactions that occur if he is still alive if Hillary Clinton is chasing you, and if he is still alive during the boss rush. This is opposed to Dylann Roof, who disappears from the game once the boss rush has begun if he was not defeated in a state. Bill Clinton with 25 HP. He drops the Volume Switch upon defeat. Carbink using Rock Slide, summoned by Herdier. Effects: Secret Power summons a Carbink, who will summon three rocks in front of it. A second later, the rocks slide and extend downward, which is when the hitbox is applied. Mega Diancie using Diamond Storm, summoned by Stoutland! Base Damage: 6. This applies for all forms of the attack. Evolution Differences: Lillipup and Herdier will summon the Carbink. However, Stoutland and Metagross will have an entirely different move entirely: Diancie will be summoned and use Diamond Storm! Diancie will show up, mega evolve into Mega Diancie, summon the large pink diamond above its head (where it faces depends on what direction Robert was facing), and rotate the diamond in the cardinal directions before returning to its original spot. Each rotation has a hitbox. This covers a massive amount of area. Explanation: Arkansas has this super-cool tourist attraction, the Crater of Diamonds State Park. It's the only diamond mine in the world open to the public, and visitors can keep what they excavate. It's still active! 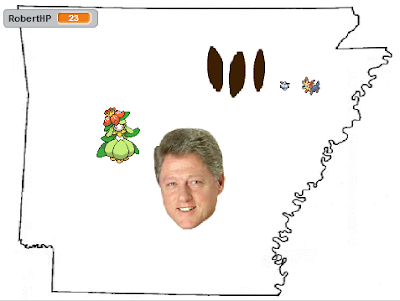 As for Bill Clinton, obviously, he was the governor of Arkansas. 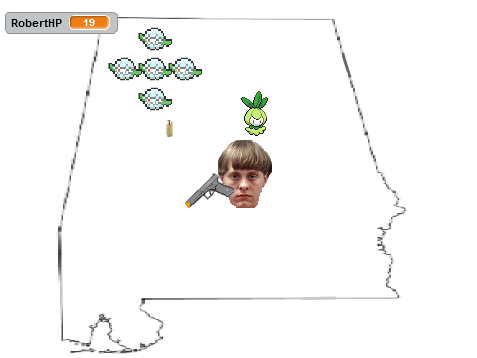 The humans in this game represent people who have shamed the South. Bill was once a Southern hero, but lately his image has been tarnished by his infidelities, which is the opposite of something a Southern gentleman would do. Louisiana has the most dramatic border shape of all of the states, but you end up spawning to the same location in the adjacent state no matter how you cross it. Effects: Corphish will be summoned and use Aqua Jet, which involves scurrying forwards (leaving a trail of water) and then doing a figure-8, before disappearing. The hitbox is constant (lingering) on Corphish during the figure-8, but there is no hitbox for the initial steps forward. Base Damage: 3 damage per contact with a non-invincible frame. Evolution Differences: Lillipup and Herdier summon Corphish, while Stoutland and Metagross summon Crawdaunt. Metagross's Crawdaunt goes further out than the dogs’. Explanation: Lobster/crayfish are a delicacy in Louisiana, and the vast majority of the USA's crayfish are harvested from Louisiana. While Texas is the largest state on the map, it doesn't have the most surface area for the game. Texas has the least number of border states, at two, not counting Washington D.C. only going to Virginia. Texas was the first state programmed, and the state to begin the boss rush, so it'll be the start of Part 3 of this strategy guide! Stoutland trying to impress the rescued Petilil with his perfectly-spaced Rapidash. Effects: The horse rushes forward with Flame Charge, with a constant hitbox until it disappears. In its path is a trail of flames. Base Damage: 4 damage. While the hitbox is constant, the invincibility frames last longer than when the duration of the Flame Charge. 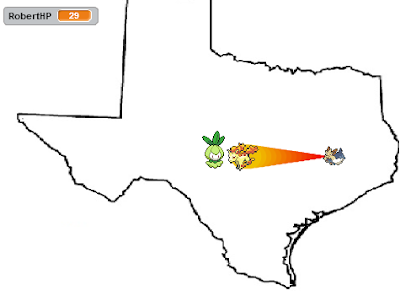 Evolution Differences: Lillipup and Herdier have Ponyta, while Stoutland and Metagross have Rapidash. Stoutland's Rapidash goes further than Ponyta, and Metagross's goes further than Stoutland's. Rapidash leaves a larger trail of flame than Lillipup and Herdier's Ponyta. Explanation: Everyone associates Texas with horse-riding cowboys! The original idea was to just lob a bunch of oil in front of Robert, but bringing Ponyta/Rapidash into the game fit its spirit much better than that. ...And that's all of the states. There are another set of moves you can use in the FINAL boss battle, but those don't count as Secret Power, and will be covered in the next guide. That next guide will cover the boss rush through all of the states we just discussed, and the final battle afterwards! The point of the flag-collecting half, in terms of the game's design is to get you comfortable with how your moves work, along with the basic movement mechanics. One last note: Whenever you have the flag, Hillary Clinton will be in pursuit of you — and she gets faster the more progress you make in the game. She has infinite HP. The most you can do is send her backwards and stun her, which you can do with any Secret Power hitbox. The stun is temporary and is on a timer (3 seconds by default), but it's possible to run through several states while she's stunned. Be careful, though: If she touches you, she'll do 5 damage to you and run back to Washington D.C. with the flag! So then you'll need to come back and get it. It's therefore safer to try to lure Hillary to a state with a longer-range Secret Power, stun her, and then run to your destination. Find the best paths through the states to accomplish your goals! Ludwig hopes that players will appreciate the non-linearity of Capture the Confederate Flag, since you can return flags to the states in any order you want. He recommends playing through the game multiple times for the different endings, and defeating each enemy in every state for a player's first run, since that's the easiest way to play through the game. KoopaTV's next game is coming out quite soon, so look forward to that as well. Here is the final strategy guide: Part 3! I'm sure this will help if I ever try playing this again. Fatigue returned for me and sometimes it takes so much effort for me to want to even play a video game. Well, thank you for taking the time to at least get out of bed. I know that was really hard for me yesterday and today.